While your laptop obviously works great on-the-go, you can use it at home too. 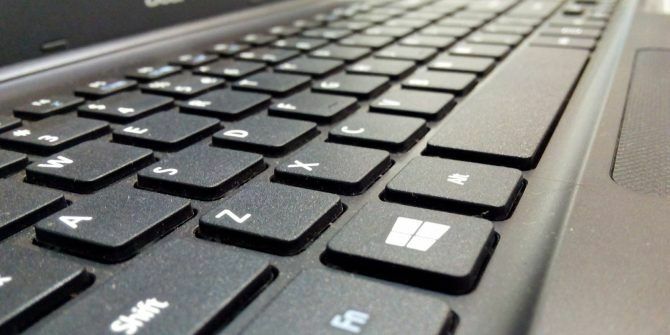 By connecting an external keyboard, mouse, and monitor, a laptop can function like a desktop. But there’s one problem: By default, Windows puts your laptop to sleep when you close the lid. This means that even if you don’t want to use your laptop screen as a secondary monitor How to Use Your Laptop Like an External Monitor How to Use Your Laptop Like an External Monitor Don't have an extra monitor? If you have a separate laptop, you can repurpose the laptop as a second screen to boost screen space. Read More , you still have to keep it open to keep your computer awake. Or do you? Thankfully, you can change this behavior. Here’s how. In the System Tray (bottom-right corner of the screen), find the Battery icon. You may have to click the small arrow to show all icons. Right-click the Battery and choose Power Options. On the left of the Power Options menu, select Choose what closing the lid does. You’ll see options for the power and sleep buttons How to Use Your Windows 10 Power Button How to Use Your Windows 10 Power Button You can shut down Windows using the physical button on your computer or the commands on the Start Menu. We explain what these options do and how to tweak them. Read More . Under When I close the lid, change the dropdown box for Plugged in (and On Battery if you want) to Do nothing. Click Save Changes and you’re good to go. Now when you close your laptop screen, it will continue to run as normal. This means that you can control it with external devices while the laptop itself is neatly tucked away. However, remember that you’ll need to put your laptop to sleep or shut it down using the commands on the Start Menu once you’ve made this change. The default shortcut for closing the lid to put your PC to sleep is convenient when you’re putting your laptop in a bag. But if you forget about that after changing this option, you could accidentally put your laptop in an enclosed space while it’s still on. This will generate a lot of heat and can damage your computer 5 Ways To Utterly Destroy Your Laptop, Slowly But Surely 5 Ways To Utterly Destroy Your Laptop, Slowly But Surely Your laptop is a fragile piece of machinery. It’s a complex system packed with fast hardware, yet it also finds itself in constant use. This is how you prolong its lifespan. Read More . Thus, you should consider only changing the lid setting for Plugged in and always plugging in your laptop when you use it at your desk. How to Create a Bootable USB Drive From Your Windows CDWhat’s the Problem With NCH Software & How to Remove It? My computer is correctly set to do nothing when I closed the lid, and this has worked fine for months now. As of today, it no longer works. I have tried changing it to Sleep, and then saved changes, and then I changed it back to Do Nothing and saved changes, and it still sleeps when I close the lid. Is this because of a new Windows update? I am needing to fiddle around with computer settings when I would rather be doing other things, and I shouldn't have to be doing this. When I close the lid on my laptop the screen shuts off. I used Windows 10 settings to keep it on (choose "Do Nothing") but the screen shuts off anyway whenever I close the lid. Does anyone know how to fix this? This happens to me everyday and I have to go into the power settings every morning and save it in order to close my lid. Its very annoying!! I tried using this Windows 10 feature - I changed the setting to "Do Nothing" when I close the lid for Battery & Plugged In, and when I close the lid the screen turns off anyway. Why is that and how do I get it to work as I intend? I just updated my laptop "https://support.microsoft.com/en-us/help/4089848/windows-10-update-kb4089848"